WAIST HIGH: Now It's Professor Marr. Guitar legend Johnny Marr has been appointed a professor of music. The 43 year old has relocated from Portland, Oregon to his native Manchester to teach at the University of Salford, which is ranked in the top 10 for teaching in the U.K. He is to pass on his expertise to students on the BA course in popular music and recording. Marr made his name with The Smiths and has performed with some of the biggest names in popular music in the past two decades. After his songwriting partnership with Morrissey came to an end, he went on to form Electronic with Bernard Sumner of New Order. A singer, keyboardist and harmonica player, he has also been a sought-after session musician. Marr said: "Salford University is offering some fantastic opportunities to students in music. It is an honour to be appointed as a professor and I'm excited at the prospect of being able to make a contribution." 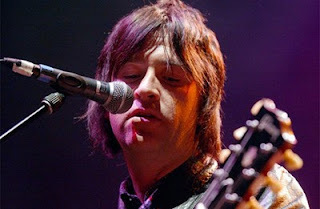 This latest venture comes after he received a Q Lifetime Achievement Award and hit the top of the US charts with his current band, American indie rockers Modest Mouse. But it's not the first time Johnny has visited Salford University. He played there with The Smiths in 1986, which he regards as one of the best gigs he ever played. He said: "The PA had to be tied down because the floor was bouncing up so high that the stage was practically falling to pieces." Johnny was formally appointed a visiting professor of music at a reception with Professor Michael Harloe, the vice-chancellor, and registrar Dr. Adrian Graves. John Sweeney, from the school of media, music and performance, said: "Johnny is a revered guitarist and composer and is held in the highest esteem by many of his fellow performers. "At the moment he is back at the height of his considerable powers, so it is a tremendous opportunity for our students to gain from his expertise and experience."